First deal of the day sounds done. The Eagles really aren’t comfortable letting go of the NFC! Buzz building for Jacksonville Jaguars EDGE Dante Fowler Jr.
Just said on @nflnetwork: As trade deadline approaches, the #Jaguars‘ phones have been ringing and there is serious interest in DE Dante Fowler Jr., per sources. Price has been high, but a lot of teams looking for pass rush and that’s a name to watch. #Jaguars getting a lot of calls about DE Dante Fowler who is expected to be a free agent after the season. A Dante Fowler trade to #rams would be all kinds of appropriate….if that were to happen. The NFL trade deadline is at 4pm ET/1pm PT. What do the Rams need? Obviously the lack of premier talent at the edge rusher position looms largest. I’d push against the idea that that’s an actual need right now since, in case you haven’t noticed, the Rams are 8-0. Our level of roster need just isn’t high. That being said, it’s obviously a point of weakness that could be improved upon. We could also point to cornerback with CB Aqib Talib still out for a couple of weeks. Even when he returns, his play could well be affected (see: CB Marcus Peters playing through a calf injury…). 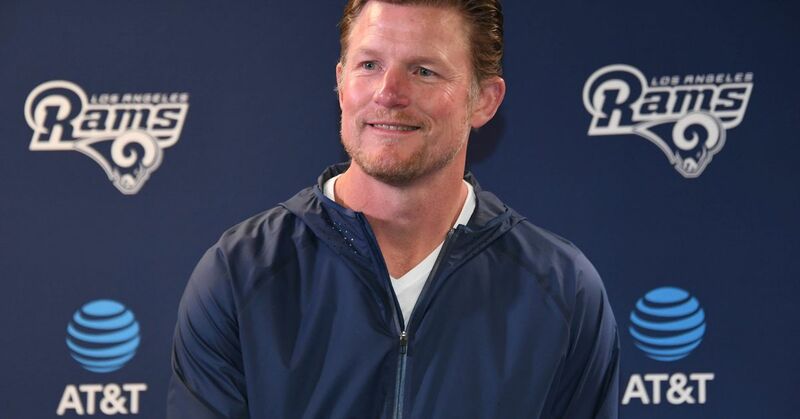 Rams General Manager Les Snead hasn’t been publicly available, but Head Coach Sean McVay spoke to the media yesterday.